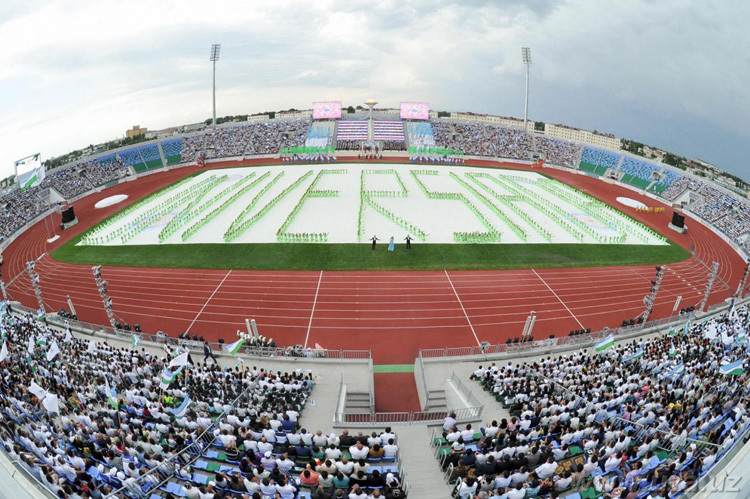 The Republican sport event “Universiade-2016” among students of higher educational institutions started in Fergana on May 26. Participants of "Universiade-2016" gave a solemn oath to be faithful to their Motherland, a support of the people and the country, to mobilize all knowledge, strength, talent, opportunities and potential in the way of the prosperity of Homeland and further enhancement its authority in the international arena. For millions of our children, effectively using these conditions and opportunities, physical education and sport became an integral part of life. This is reflected in their physical perfection, great victories in international competitions. Establishment of Children's Sports Development Fund activity plays an important role in achieving good results in this direction. In 2005, in our country, only 30 percent of children aged 6-15 engaged in sports, and in 2015 this figure was 57.2 percent. Introduced, by the initiative of the Head of our state, three-tier system of sports competitions “Umid Nihollari”, “Barkamol Avlod” and “Universiade” contributes to strengthening in the hearts of millions of young people feelings of love for the Motherland, loyalty to the ideas of independence, national pride, the desire for a worthy continuation of the traditions of our ancestors, the achievement of goals such as the conquest of the highest milestones in the world of sports. Three-tier sports games are conducted on the basis of the rules and requirements of the Olympic Games. Our athletes, physically and mentally hardened, multiply the experience and skill in this competitions, successfully perform at prestigious sporting forums - the championships of the continent and the world, the Asian and Olympic Games. It is deeply symbolic that the current Universiade is held in the Olympic Games year. Both the Olympics and the Universiade are a celebration of unity and friendship of the athletes, the arena to demonstrate their experiences and skills. Among the participants of “Universiade-2016” there are athletes who have received licenses for the Olympic Games. For them, the participation in student sports games would be a kind of preparation for the prestigious competition. The program of “Universiade-2016” includes 15 types of sport, such as basketball, boxing, volleyball, handball, judo, track and field and weightlifting, table tennis, swimming, taekwondo (WTF), tennis, football, chess, freestyle and Greco Roman wrestling. Almost all of these types of sports are included in the Olympic program. Sportsmen that became the winners of regional qualifying competitions take part in “Universiade-2016”. Many of them increased their skills and experience in sports competitions “Umid Nihollari” and “Barkamol Avlod”. On the basis of the resolution of the Head of our state from November 15, 2011 on the implementation of the general plan of Fergana, activities on construction and reconstruction of social and transport-municipal infrastructure in 2012-2015, a large-scale creative work was carried out in the city. New roads were laid, existing - reconstructed, bridges and streets were built. The International Airport “Fargona”, a number of administrative buildings were also reconstructed, as well as modern hotels, multi-storey residential buildings, recreation parks, alleys, an amphitheater with a laser show, musical fountains were built. All the streets and squares of the city planted with ornamental trees and flowers that provide a microclimate. The Theatrical Concert Palace, embodied the tradition of modern architecture and the national architecture, was commissioned. All the conditions for the spectators created there. The palace is decorated with shady park, covering forty acres, and musical fountain. At the site of the “Neftchi” stadium was constructed sports complex, swimming pool, Youth Center in the “Mustakillik” street, and all of this is a practical embodiment of the attention paid to the comprehensive development of young people. A thorough preparation for the Universiade was held in Fergana region. Extensive work on the creation and improvement was implemented. The “Istiklol” stadium for 20 thousand places, built on the basis of international standards, gives a special beauty to the city by its unique architectural and engineering solution and unique design. A sports complex football stadium for 3200 seats, an indoor swimming pool, three volleyball courts and a running track for athletics were erected in the Fergana State University. Sports gym of the Fergana College of Olympic Reserve was renovated. The work on the repair of four buildings of students and a dining hall of the Fergana Polytechnic Institute was carried out. A rich cultural program prepared for the participants of the competition. Within its framework, will be meetings with famous athletes, writers and poets, artists, Fergana sightseeing tours, various shows and concerts. The opening ceremony of “Universiada- 2016” ended with a big concert program.